Are Australian carcase weights getting too heavy for market requirements? IS Australia running the risk of producing beef carcases, particularly from grainfed cattle, that are too heavy for market requirements? 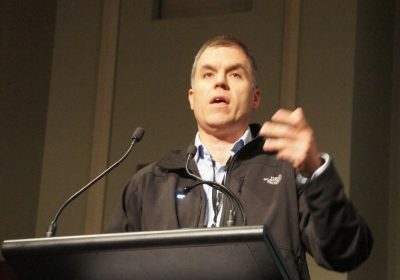 The subject was raised several times by different speakers at the Angus Australia national conference in Ballarat recently. These heavy grassfed carcases in a southern Australian plant averaged close to 380kg dressed weight. Teys Australia’s general manager corporate affairs, Tom Maguire, warned Angus breeders against selecting cattle for excessive carcase size. “Our fed (Angus) carcase weights at the moment are heavier than what our customers want,” he said. During questiontime, Angus seedstock breeder Sam White from Bald Blair said it was the first time he had heard anybody game enough to say that Australian carcases may be getting too big. He asked whether that would ‘come back’ on the industry, through customers saying the product was too large, or whether they would simply ‘cut-up’ primals even further. “It’s the reason why Australia’s two largest retailers put upper limit penalties on carcase weights,” Mr Maguire said. In Teys own grids (which also supply beef to major domestic supermarkets) grid prices dropped-off, pretty sharply, beyond a certain weight, in most categories. “What retailers are saying is that because they present beef either in MAP trays or over-wrap, the cuts are literally getting to the point where they are too big to fit within the tray,” Mr Maguire said. Mr Maguire said particularly in today’s era of high red meat prices, many consumers were in fact looking for a smaller steak, to hit a price-point at retail. “The same is happening at food service. We certainly do get that push-back coming in, because the bigger a serve portion of beef gets, the more it costs,” he said. And the issue was a lot wider than just Angus cattle in Australia. Average carcase weights in the US beef industry had risen about 300 pounds (120kg) in the past 40 years, Mr Maguire said. “People say that’s great for efficient beef production, but a study out of the US in 2016 (Oklahoma State U), suggested that the loss in consumer welfare (a somewhat vague term, an economic measure, translating into a consumer’s willingness to pay for a product) caused by the growth in carcase weights, had cost the US beef industry US$8.6 billion over 40 years. “That’s a staggering sum. And it’s because US carcase weights have got to a size well beyond what the consumer wants in a steak. In essence it means if a consumer is buying on a price, they are getting a thinner steak from a larger carcase, than they would otherwise want,” he said. Mr Maguire told the Angus conference that Teys was in the process of installing advanced individual cuts traceability systems (more details to come on Beef Central) into some company boning rooms, that would allow each primal cut to be linked back to the individual carcases they came from. “We can then start to record primal weights and trim weights from each carcase, which in turn will allow us to train the DEXA objective yield calculation technology to predict each primal weight, as a carcase is scanned,” he said. 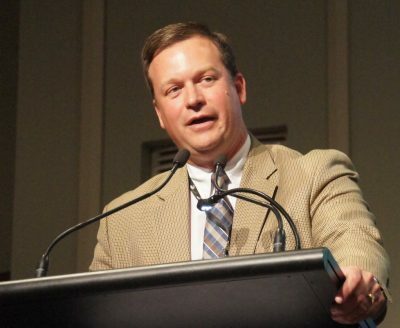 “We know there is a poor relationship between carcase weights and individual cut weights presently, but if we can get this right, making this prediction for us, it may allow us to open up more cattle into some of these premium markets,” he said. Domestic wholesalers consistently tell Beef Central that there are premiums available for smaller primals, from carcases at the lighter-end of the MSA carcase spectrum. “It applies especially to loin cuts, and can often be as much as 50c/kg on a good Angus MSA yearling, all other things, apart from carcase weight, being equal,” one prominent wholesaler told Beef Central last week. “I could sell my entire weekly quota of MSA primals on a Monday morning, if I knew if could get it all from carcases in the 200-240kg range. Butchers love it, because it allows them to put four good-sized steaks on a tray,” the wholesaler said. “But equally processors don’t like it, because it impacts on cost-to-kill, and cost-to-bone, because fixed costs on a carcase don’t change much, regardless of how big it is. Where a heavier MSA carcase might cost 8c/kg to process, a lighter carcase might 10c/kg. It adds up, on a 280kg or 300kg carcase,” he said. Another Angus conference speaker, Dr Dan Moser, president of Angus Genetics Inc and director of performance programs with the American Angus Association, said the carcase weight issue was very evident in the US industry. “Our grids used to apply discounts above 900 pounds (409kg), but that has crept up to 950, 1000 pounds, and some packer grids now have the upper limit before discounts apply at 1050-1100 pounds (472-500kg),” Dr Moser said. In the past few months, however, there had been some decline in US carcase weights, as feedlots became more current. Dr Moser said the US industry’s almost total reliance on feedlot finishing systems only made the problem more acute than it was in Australia. 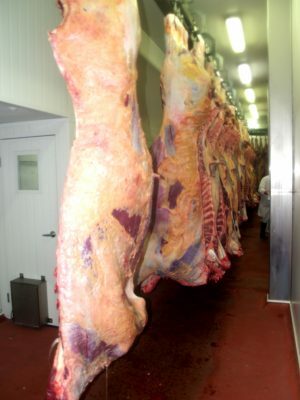 One of the reasons major US beef processor, Tyson, recently closed one of its beef plants was that it was an older facility, simply not designed to take carcases as big as those currently being produced in the US. “They had rails falling from the roof, due to the weight,” he said. “Certainly excess carcase weights and the challenges they create when trying to produce attractively shaped beef serve portions is a topic of regular discussion in the US industry – as it is obviously also becoming in Australia. But the way the US grid pricing system works, there’s not a big discount for that extra fat cover and carcase weight. And while ever feed is cheap, every day they feed those cattle, they’re in an extra day of profit,” Dr Moser said. Dr Moser also made references to a lack of adequate engagement between the US seedstock sector, and other industry sectors such as lotfeeders and packers over issues like carcase weight. “Our industry, as yours is, is very segmented,” he said. Dr Moser said more seedstock producers in the US were now selectively breeding to moderate cow weight, and there was a ‘pretty strong’ relationship between breeding cow weight and carcase weights in fed cattle, that might help. “We’re trying to collect more breeding cow weight data. We’d like to have as much early growth as possible, but still keep cows at a manageable size,” he said. Meat & Livestock Australia has plotted a steady rise in carcase weights in slaughter cattle across Australia for the past 20 years. While Australian beef production for the March quarter declined 6pc year-on-year, quarterly carcase weights averaged a record 295.34kg/head – 2pc higher than the same period last year. MLA has now revised its forecast for average adult carcase weights for 2017 one percent higher, to 291kg. “The average carcase weight for Australian cattle was the highest ever during the summer months – the result of a higher proportion of cattle on feed for longer, heavier grassfed cattle coming through the system after last winter’s rain, as well as the significant drop in female slaughter,” MLA said recently. Heavier carcase weights were helping offset the decline in overall tonnage of beef produced, however, caused by constrained cattle supply. Greater reliance on lotfeeding in Australia is exacerbating the shift in carcase weights. As the recent March quarterly feedlot survey results showed, cattle on feed numbers are at a record high in Australia above one million head, at the same time as overall slaughter numbers are back 15-20 percent on 2015 levels.